Understanding the life cycles, habitat/colony structure, and social structures of the Fire Ant will give you the insight needed to rid your property of these pests and maintain control them. In warm weather, low winds, and high humidity as within 24 hrs of a rain winged male and females Fire Ants fly 300 to 800 feet in the air to mate. The males soon die after mating. The females land, break off their wings and search for a place to establish her new colony. She digs small chambers in the soil 2– 5 inches and lays about 25 eggs. When the eggs hatch she feeds the digested wing muscles and cannibalized eggs to the developing ants. Unfertilized eggs turn into male winged ants and fertilized eggs become sterile female workers or fertile winged females. These Queens live up to 7 years, adult workers only 60-90 days. Fire Ants live in colonies in nest in the soil. Some may have a single Queen and some have multiple Queens capable of laying 1,000 eggs a day. The above ground portion of the mound may be several feet high. The underground tunnels are commonly 1-3 feet deep, but can be as much as 6 feet. They seek the soil close to the water table for moisture. Foraging tunnels near the surface may extend many feet from the mound. They forage for food up to 50 to 100 ft from the nest. Fire Ants are omnivorous insects that eat many different kinds of animal and plant material such as small animals like mice, ground dwelling amphibians and reptile and eat ground-nesting birds. Solid food from small animals, insects, seeds, fruits, inner bark of trees etc. is cut into reasonable pieces and transported back to the nest. Worker Ants search for food up to 100 feet away between temperatures between 70 to 90 degrees. When temperatures exceed 95 degrees Fire Ant only forage at night. 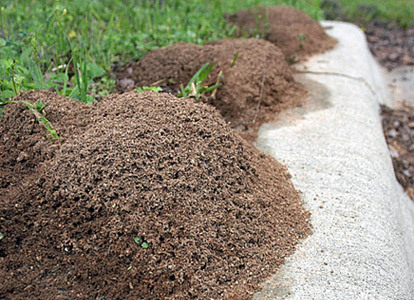 During foraging periods only a small percentage of ants may be inside the mound, the rest are out gathering. That is why there are times of day or night that dusting and drenching mounds are more effective. Adult Fire Ants must first have any solid food particles converted to liquids by older larvae in the colony before they consume it themselves. Protection of the Queen when a nest is agitated may take about 8 minutes to be triggered. The first time the nest is agitated the worker ants may not be triggered to move the Queen. But a second disturbance will trigger action to move the Queen: an important factor to consider when drenching a mound. The approach and timing is important for success. Exit holes are not at the top of the mounds that are visible but scattered around it, sometimes at quite a distance. The visible mound is the soil excavated and pushed up during construction. The size of the mound could be an indication as to how deep and wide spread the nest construction is. 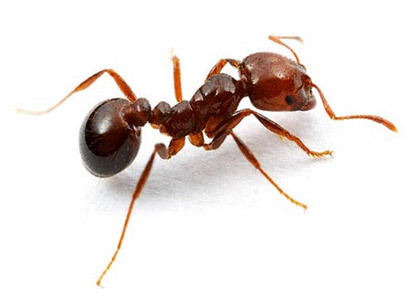 How does Perma-Guard Fire Ant Insecticide D-20 work for controlling Fire Ants? The base ingredient Diatomaceous Earth (ground fossilized shells of one cell plants called Diatoms) There are thousands of species of Diatoms. The type and shape of fossilized Diatoms found in Perma-Guard products is tubular shaped with small holes along those tubes. This allows for the absorption of fluids from insects after their exoskeletons become abraded by the holes along the tubes as they come in contact. Natural Pyrethrins (a vegetable extract from a variety of Chrysanthemum flower known as the African daisy). Pyrethrins are deadly to cold blooded insects and other cold blooded life. Fire Ants are cold blooded and quickly killed when exposed to pyrethrins. It is added to the DE for a fast knock-down action to kill the ants above ground so you have time to drench the below tunnels. Pyrethrins do not persist in the environment. Piperonyl Butoxide (PBO) is an extract of the Sassafras plant and acts as a synergist. It increases the time pyrethrins stay active once exposed to sunlight. The knock-down capacity is stable for 3 months. This allows Perma-Guard Fire Ant Insecticide to continue killing the ants that may have been outside of the parameter as they return to the nest from foraging. It will deter the rebuilding of a nest in the area it is present. Apply this product only as specified on the label. This product is labeled to be used in and around the home, yard, and animal housing. Read the label completely before use. Make a plan of action taking into account the current temperatures. It is best to treat while most of the worker ants foraging are outside of the nest. That is when temperatures are between 70 -90 degrees day or night. If temperatures are above 95 degrees the ants only forage at night. If applying dry with a duster, have your duster filled and mixture to drench the tunnels prepared. The dust kills the above ants quickly if you cover the area completely after you agitate the surface of the nest. You must then quickly drench the tunnels into the nest. You may need several gallons of the mixture prepared. There is not just one tunnel. It can be applied as a dry dust by use of any equipment (power or hand operated) or mixed with water and sprayed on as a liquid, which is the most effective way when covering a large area. Fire Ants can have 20-40 colonies per acre in severe infestations. Mixing for wet use: Mix ½ cup of Perma-Guard Fire Ant Insecticide to one gallon of water. Add a tablespoon of mild detergent to the mixture. The detergent helps keep the insecticide in suspension and contains surfactants that increase the ability of flow down the tunnels. The dust does not dissolve. It is necessary to agitate the sprayer now and then. With either method, the idea is to coat all areas where bugs may be. Applied into cracks and crevices is useful and effective. Control of Fire Ants is difficult and there is no permanent solution because there will always be winged Queens looking for somewhere to start new colonies that fly in from as far away as 12 miles. There will always be neighboring properties that are not working to control the ants. But you can make your property one the queen would not choose. This treatment can last up to 3 months before it biodegrades. 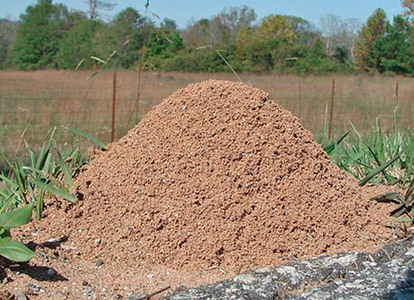 Fire ants stay below ground during cooler months and treatments are less effective. Use of Perma-Guard Fire Ant when the temperatures begin to stay in the 70s and Queen ants mate and begin looking for a place to start a colony. Then again 3 months later in the summer (above 95 Degrees at night). You should have good control over your property using these methods and timing.